Auto-locking drawer system: simple and efficient medication management at the point-of-care reduces opportunities for errors; security system stores variable-length PINs for up to 1,000 users with StyleLink software (100 users without StyleLink). Drawer system supports “Pharmacy mode,” allowing all drawers to be unlocked simultaneously to facilitate efficient stocking of medication. Extra rows of drawers may be added—up to a maximum of 5 rows. 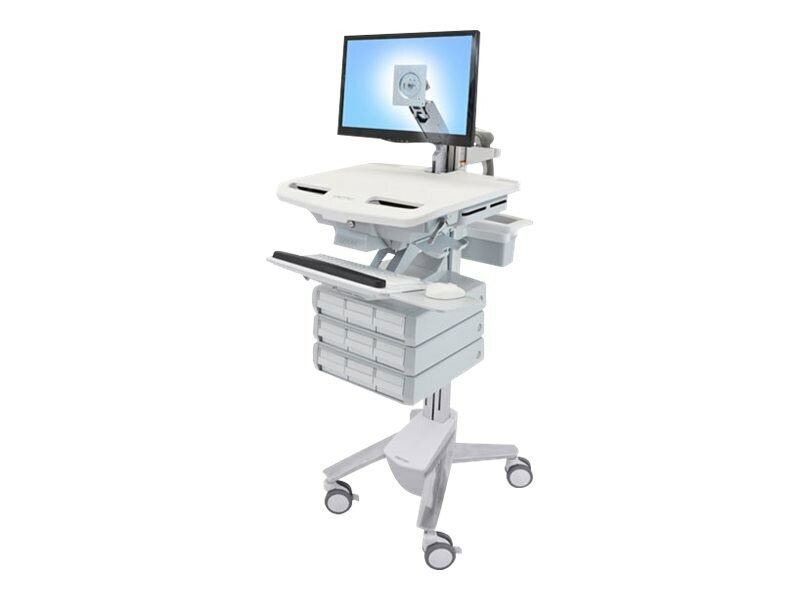 Effortlessly maneuver the cart to the point of need—StyleView quickly responds to caregivers’ touch and enables nurses to focus on their patients. LCD and keyboard pan side-to-side for closer access while interacting with clients; arm also reaches low for people wearing bifocals or using a tablet PC. Passes Ergotron’s 10,000-cycle motion test, which ensures years of trouble-free sit-to-stand height adjustment. Max weight capacity of 37 pounds. For displays up to 24".